Ironically, with the increase in the automation of your mundane or mission-critical tasks, there is a bigger need for monitoring and control, now more than ever. We need to know whether the app or software product we put in place works fine and if there are any bottlenecks in the process. We can get this information from various reporting options. If you think about it, you want a product to be made up of 90% of features that actually do the job and 10% that give you comprehensive monitoring that tells you about the success/failure of the job. 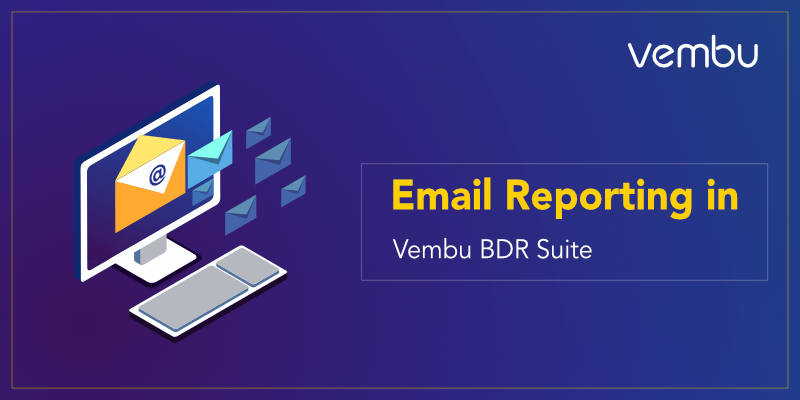 Vembu BDR Suite follows the same best practice. 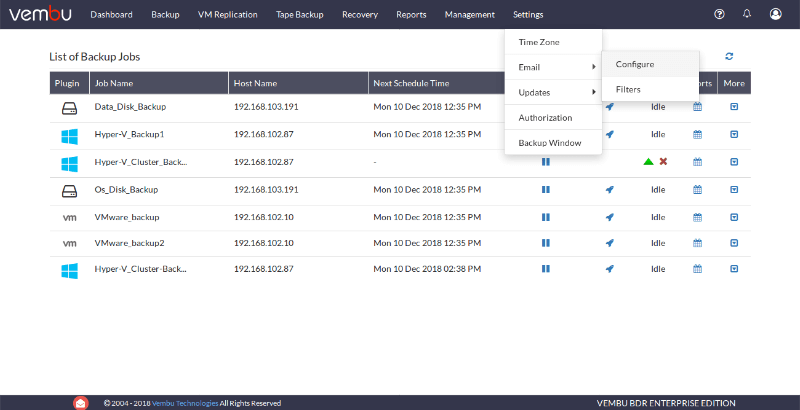 With extensive reporting options that can be automatically emailed to your inbox periodically, you will remain informed about the backup jobs you have configured. 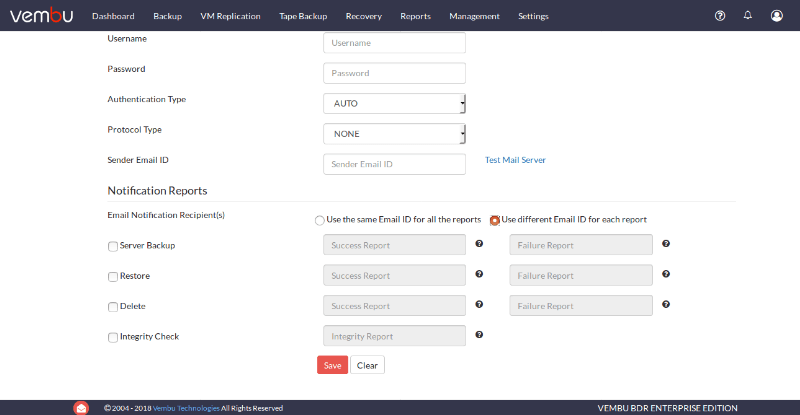 By configuring your email ID, backup and restore reports from the server can be automatically sent your inbox at your configured schedule. 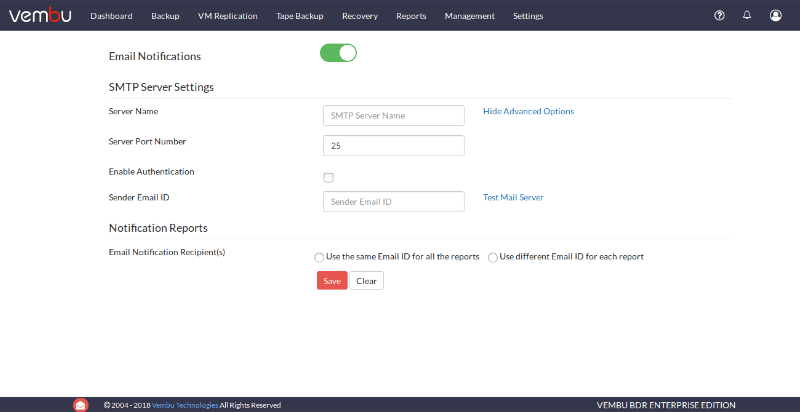 To begin email report configuration you need to first configure your SMTP Server settings. Go to Settings -> Email -> Configure. The reports will be sent to your inbox using SMTP server. To begin configuration, you need to enter the SMTP server name. You can also enter the server port number depending upon the email server you use. By entering the sender email ID and selecting Test Email Server, you can check your inbox to see a Test email sent. Once you have completed configuring the email options, you can begin selecting the reports you wish to see in your inbox. For each type of report, you can enter different email IDs for success or failure reports. There are four types of reports. Finally, select Save configuration changes. Your email ID and SMTP server info are saved. You can choose which backup reports you want to be sent to your inbox by configuring a scheduling policy. You can schedule email report by going to Reports -> Backup Status Report -> Schedule Email Reports. You can create a filter based on status and duration. You can select All Status or select only the status that you want to receive notification emails for. They can be Missed, Suspended, Failed, Successfully Completed and Partially Completed. 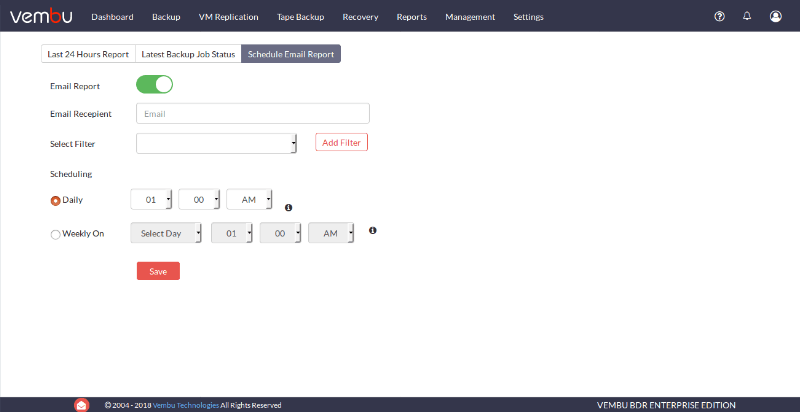 In Duration, you can get reports for the backup jobs with the selected status for the last few days (from 1 day to 30) or for a specific date range. You can schedule these reports for Daily or Weekly basis irrespective of the filter duration. You can find Server Email Filters in Settings that have similar options like Suspended, Successfully Completed and so on. 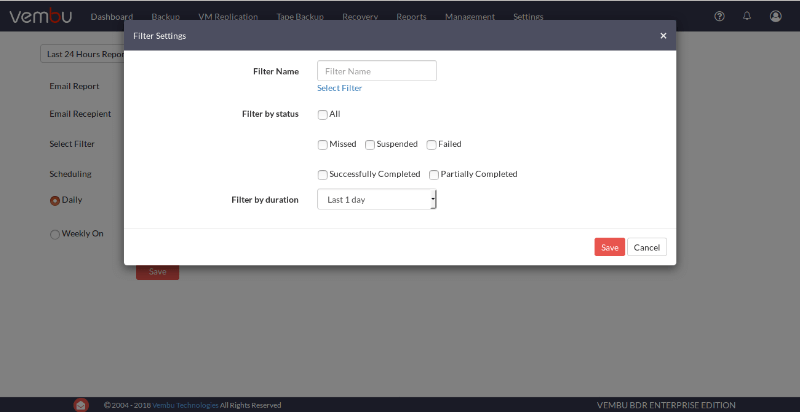 There is one extra option you can enable if you are using a backup proxy. You can exclude certain clients (proxies) or particular backup jobs in those clients from the reports. By providing reports directly to your inbox, it doesn’t matter where you are and what you do, you can always keep an eye on whether the backups of your business-critical data are successful.